If you use the same yarn and hook size given in the supplies list then you should get a chicken about 5 inches tall. How to crochet the comb. 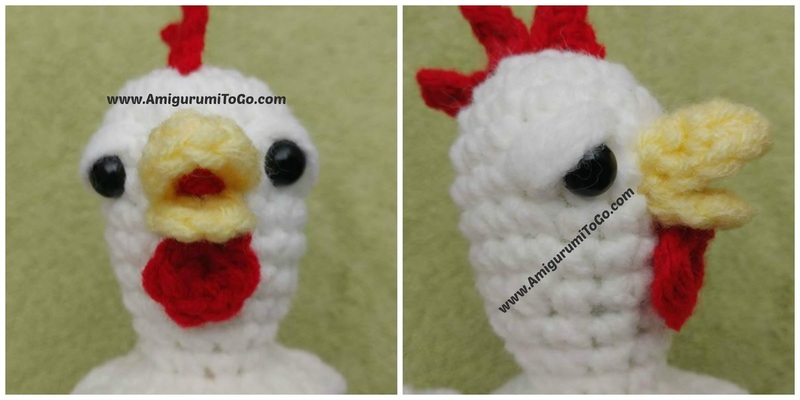 How to crochet row 2 of the top beak. How to assemble the tail feathers. How to sew everything to the chicken's body. 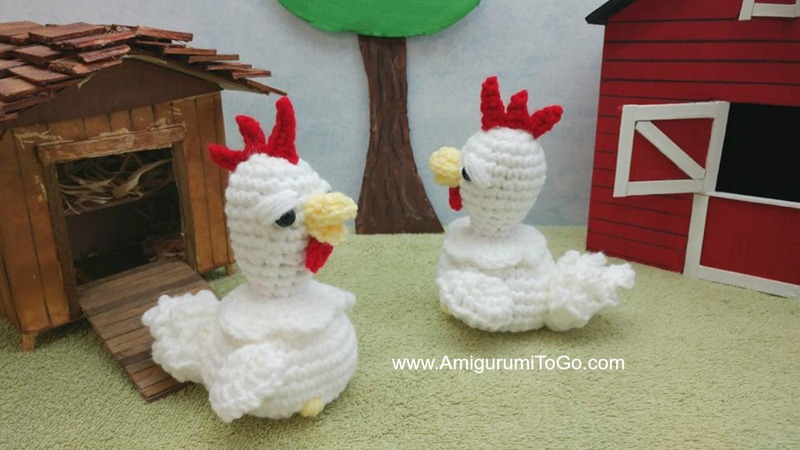 The head and body of the chicken is almost identical to the Turkey pattern I released a few days prior to this chicken pattern. Please compare the written patterns and see where you might need help. 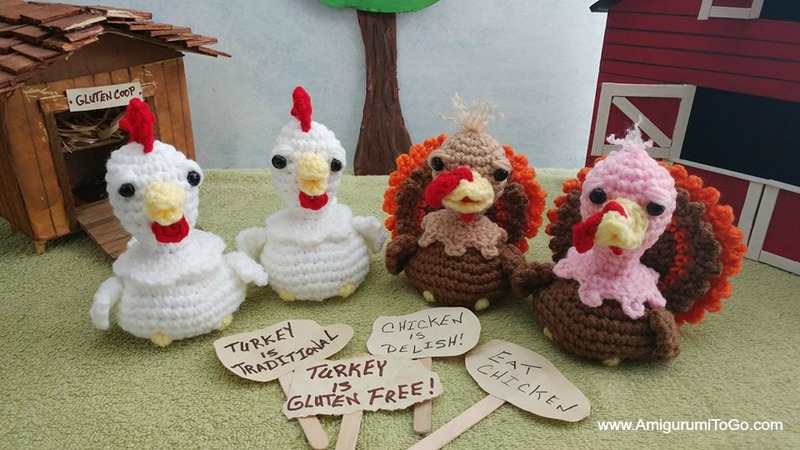 The turkey pattern has 2 videos that show how to install the safety eyes, how to crochet in the FLO, how to crochet the loops inside the neck and how to inc in the rows inside the neck. How to stuff the body. 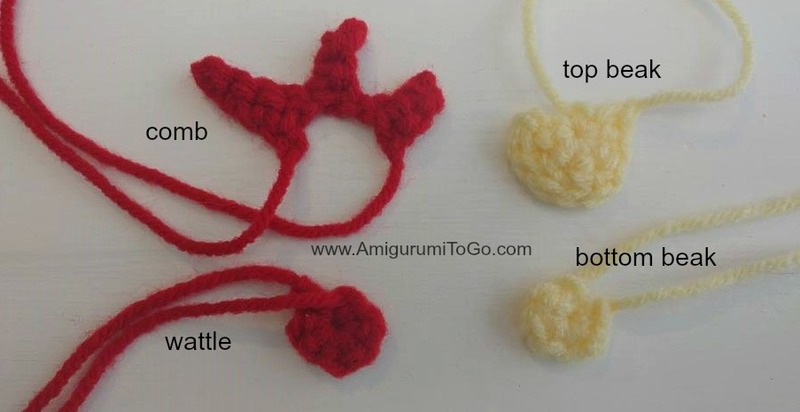 How to crochet the last row and close up the body and add the feet. How to crochet row 4 of the wings. 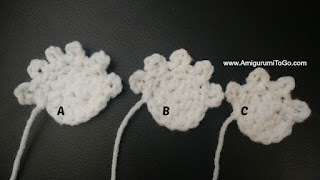 The tail feathers for both the turkey and the chicken are started the same with hdc, row 2 increases the same and the final rows use the same chain that makes the outer ruffle of the feathers. Should you need help, get those video links and compare the written patterns here. There's a very short story that includes a Thanksgiving Turkey and Cora. Read that story and also get the pattern for the turkey here. Scroll down this page for the Chicken's written pattern. 1) magic circle or adjustable loop with 6sc (6) *the starting yarn tail should be long enough to sew into the body. 1) ch5 *the starting yarn tail should be long enough to sew into the body. The eyes go in between the 5th and 6th row with 4 visible stitch holes between them. 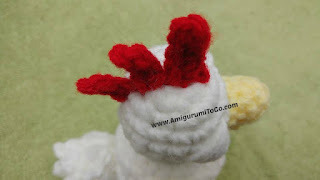 In the video tutorial I show how to sew the beak and the comb in after the body has been stuffed and closed. You can do this now. Watch how it's done then you decide what would be easiest for you. Which rows to sew on is in the assembly section below. f/o leaving a tail for sewing. Weave in and out of the remaining st, stuff more into the body as needed then pull yarn tail to close gap. Knot off to hold the gap closed then bring the yarn tail up through the body and out through row 16, Stitch around to hold row 16 to the body, knot off then hide yarn tail inside the body. 4) ch2 then 1sc through both sides, ch2 then 1sc though both sides, repeat sequence across closing up the open edges. f/o leaving a tail for sewing. Bring the yarn tail in between the 1st and 2nd row on the edge, knot it off and use it for sewing. The tail section is made of 3 pieces that get sewn together. Work the starting yarn tail into row 2 for all 3 pieces. 3) 1sc in the next st, ch4, 1sc through the sc you made before starting the ch, 1sc in the next st. Repeat this sequence 4 times. Place the wrong sides of A and B together then place the wrong side of C over B. Whip stitch the bottom of the feathers together. Please view the video if you need help at any time during assembly. The instructions below are given in the same order the video was filmed. 1) Sew the tail feathers onto the chicken with C, (the smallest piece), against the body. Feel free to play around with the final look of the feathers. I sewed the bottom half of the feathers to the body then tacked the end ruffle of each section down. See photos or watch the video. 3) If you want eyelids, add them now. Pull yarn through the center hole of row 1 at the top of the head and knot it off at the top, then bring the yarn down to the corner of the eye wrap over the eye a few times there until you have an eyelid, once done, carry the yarn tail over to the other eye and do the same. Once done with both eyes, bring the yarn tail back up and out through the center hole of row 1, knot off, then carry the yarn tail through somewhere else and cut free. 4) Sew the comb in. The tallest piece goes in the front. The front yarn tail should be sewn in between the 2nd and 3rd row, the back yarn tail in between the 3rd and 4th row. Use the yarn tails to sew the bottom edge of the comb in place. If unsure, view the video. Once done, knot off, then carry the yarn tail through somewhere else and cut free. 5) Sew the top beak in, wrong side up. Bring the starting yarn tail through the 5th and 6th row, in the center of the eyes. Sew each corner in between the 6th and 7th row. Be sure to shape the beak while sewing. Once done, leave the yarn tails hanging in the back of the head until you have the bottom beak sewn in. 6) Sew the bottom beak in, doesn't matter which side up. 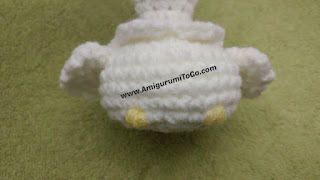 Bring the starting yarn tail through the 6th and 7th row, in the center of the top beak. Sew each corner in the same place as the top beak, in between the 6th and 7th row. Once done, knot the yarn tails off just under the bottom beak on the white, knot off all the beak yarn tails in that area then carry them back through the head and cut free. Don't worry if you see any knots there, the wattle will cover them. 7) Sew in the wattle. Thread both yarn tails and carry them through the head, under the bottom beak in the center. You can knot one yarn tail anywhere on the comb then carry the yarn tail back through the head and cut free. You can use the other one to make a tongue, if you want one. Pull the yarn tail through the center of the 2 beaks, wrap around a bit of yarn in there and knot off, creating a small bump that looks like a tongue. Once done, carry the yarn tail back through the head and cut free. 8) Add feet. Set the chicken on a flat surface, the row just above the flat surface is where you add the feet. Bring yellow yarn through a stitch hole at the bottom of the chicken's body and out to where the first foot will go, in line with the eyes, wrap yarn over the row about 7 or 8 times, then carry the yarn tail over about 5 stitch holes over and wrap the other foot. Bring the finishing yarn tail out through the same stitch hole you went in, knot them together, then carry the yarn tails away from that area and cut free.